NORTHFIELD – The world lost a legend and a giant in the realm of entertainment yesterday, with the passing of Stan Lee at the age of 95. The creator of some of the world’s most popular characters, including Spider-Man, the Avengers, and the X-Men, Lee has left behind a stunning legacy, although some fans believe there may still be a chance to save the iconic creator. A few online commenters on Geek Mountain State have suggested that Lee could be physically dead, while having his soul somehow preserved in the powerful Soul Stone, one of six infinity stones that were created by Lee’s friend and collaborator Jim Starlin. This is not the first time fans have refused to believe a beloved public figure has died, and Stan Lee now joins the ranks of Elvis Presley, Tupac Shakur, and many others with fan bases holding out hope that their heroes will reappear. 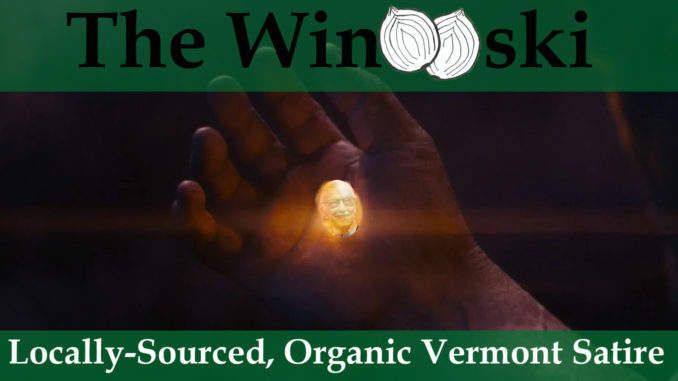 Unfortunately, we here at The Winooski do not believe that Stan Lee is trapped in the soul stone. We feel that one must look at the hard truth of reality, which leads us all to the sad but obvious conclusion that a myth-maker and story-spinner is no longer with us, but is instead trapped in a regenerative cocoon somewhere in space and needs our help to bring him home to earth. For anyone that wants to join us, we’re firing up the Fantasti-Car in a few minutes. Excelsior!